What? 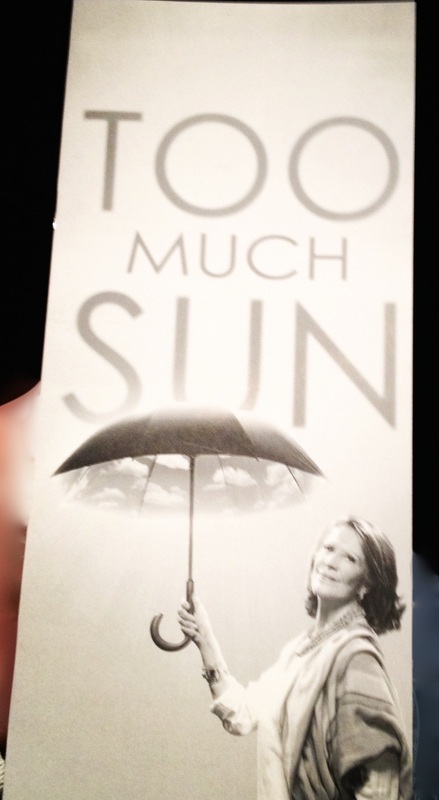 From the show website: "In TOO MUCH SUN, Audrey Langham - a celebrated actress - unravels completely while preparing for a new production of MEDEA. With nowhere else to go, she descends upon her married daughter for a summer by the sea. She is not, however, greeted with confetti and champagne. Her arrival sets off a chain of events alternately hilarious and harrowing. 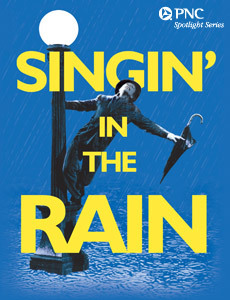 This stirring story of an unforgettable summer reunites playwright Nicky Silver, director Mark Brokaw and Tony Award-winning actress Linda Lavin following their acclaimed collaboration on THE LYONS and its subsequent Broadway transfer." What? From the show website: "Drama Desk Awards, which are given annually in a number of categories, are the only major New York theater honors for which productions on Broadway, Off-Broadway and Off-Off Broadway compete against each other in the same category. Formed in 1949 by a group of New York theater critics, editors, reporters, and publishers, the organization was created to educate the community on vital issues concerning the theater.In 1955, Drama Desk became the first major organization to honor Outstanding Achievement Off-Broadway, with their Vernon Rice Awards, named for the late New York Post critic who had pioneered Off-Broadway coverage in the New York press. In 1974, as Off and Off-Off Broadway grew in importance, Drama Desk began what has become its distinct tradition - evaluating all three venues by the same criteria. 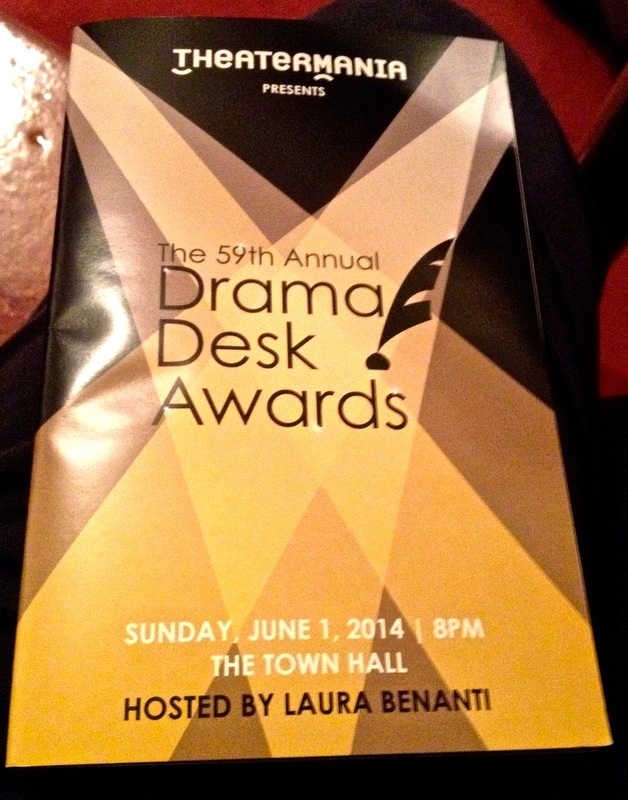 In 1974 Drama Desk also became incorporated as a not-for-profit organization. In keeping with its original mission, the organization sponsors guest panel luncheons with theater professionals. Panels address topics of current interest - covering the season on Broadway, Off Broadway and Off-Off Broadway, with the aim of prompting informative and stimulating discussion. All of Drama Desk officers and Nominating Committee members perform their various services for the organization on a voluntary basis. The Nominating Committee generally meets twice a month to discuss the many eligible shows they are responsible for seeing. They then choose the productions for nomination on which the entire membership will vote. What sets the organization apart is that the awards are voted on by media people only without any vested interests in the results." What? 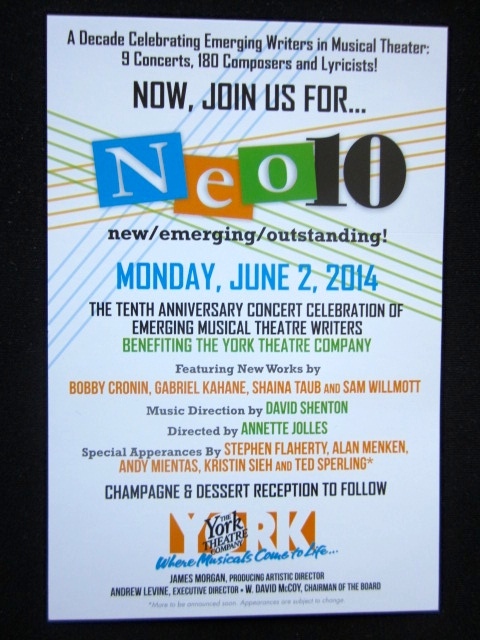 Honors the work of the four artists participating in this year's NEO program: Sam Willmott, Bobby Cronin, Gabriel Kahane and Shaina Taub. What? 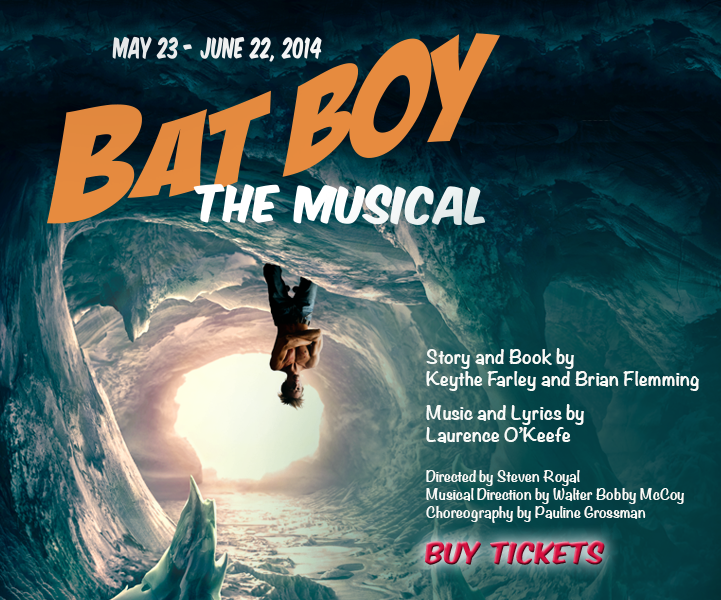 From the show website: "Ripped from the 1992 World Weekly News tabloid headline, Bat Boy:The Musical is both musical comedy/horror spoof and big-hearted satire on American prejudice. When a half boy/half bat creature is discovered in a cave near fictional Hope Falls, West Virginia, the local vet’s wife sets out to teach him the ways of civilization only to be thwarted by the colorful, narrow-minded, “civilized” townfolk who have something else in mind. 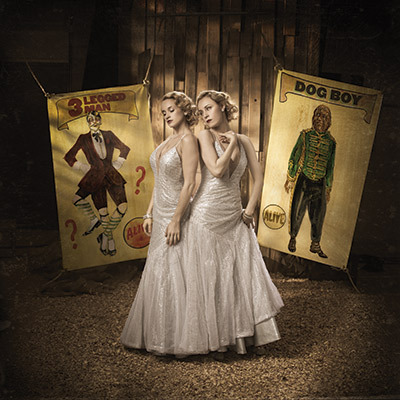 In the tradition of Sophocles, Sondheim and South Park—with hints of Mary Shelly, Tim Burton and Mel Brooks—Bat Boy weaves a smart and playful pop/rock score with a crazy take on American eccentricities." From Helen Hayes Award Winner Ed Dixon (Signature’s Sunset Boulevard) comes a delightfully screwball musical comedy send-up of the 1950s film noir. Third-rate detective Nick Cutter is down on his luck when a beautiful blonde bombshell tosses a very intriguing case (and herself) into his lap. For the next 90 minutes, Nick races through every New York neighborhood in this zany, mile-a-minute whodunit. 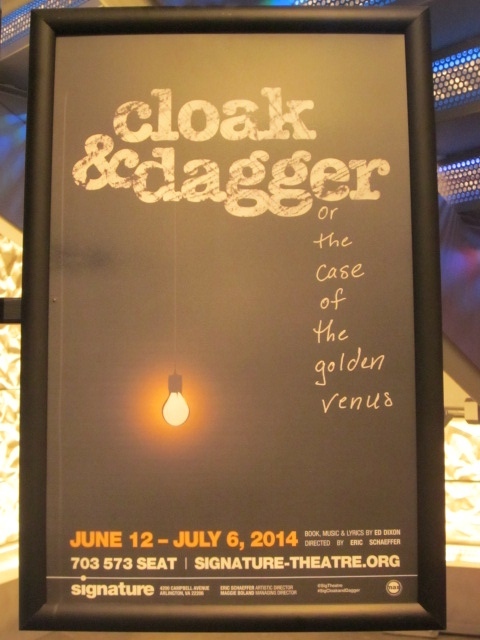 With four actors playing nearly 20 roles, Cloak and Dagger uproariously spoofs erstwhile mysteries with lightning speed and rapier wit." What? From the show website: "LCT presents the world premiere of The City of Conversation by Anthony Giardina, directed by Doug Hughes (LCT's The House in Town; this season's Outside Mullingar; and Tony Award winner for Doubt). In 1979, Washington D.C. was a place where people actually talked to each other...where adversaries fought it out on the Senate floor and then smoothed it out over drinks and hors d'oeuvres. But it was all about to change. 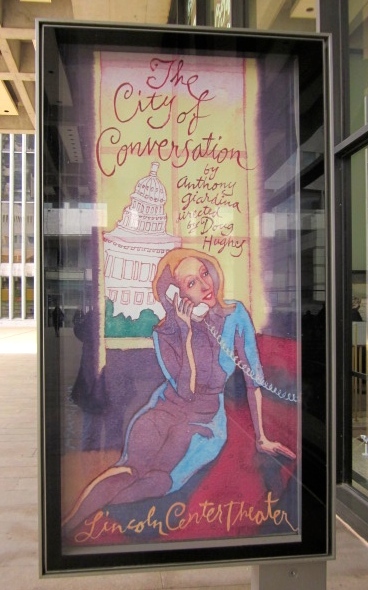 In this play spanning 30 years and six presidential administrations, five-time Tony® nominee Jan Maxwell plays savvy and elegant Hester Ferris, the doyenne of Georgetown dinner parties whose influence in liberal politics is legendary. But when her beloved son suddenly turns up with an ambitious Reaganite girlfriend and a shocking new conservative world view, Hester must choose between preserving her family and defending the causes she's spent her whole life fighting for. Don't miss this captivating, intimate and searing new family drama about just how deeply personal politics can be." What? From the show website: "A pioneer in the world of contemporary dance, Liz Lerman’s newest theatrical dance piece explores the experiences of the healers tasked with treating the physical and psychic wounds of battle. 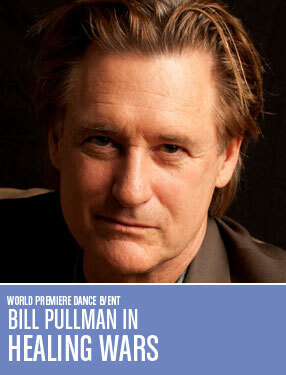 Joined by Bill Pullman (Independence Day), an ensemble of dancers represent medics and soldiers from the Civil War to today. Called “the source of an epochal revolution in the scope and purposes of dance art” (Washington Post), Lerman presents her singular aesthetic to audiences in this exciting world premiere about how we experience and recover from war."